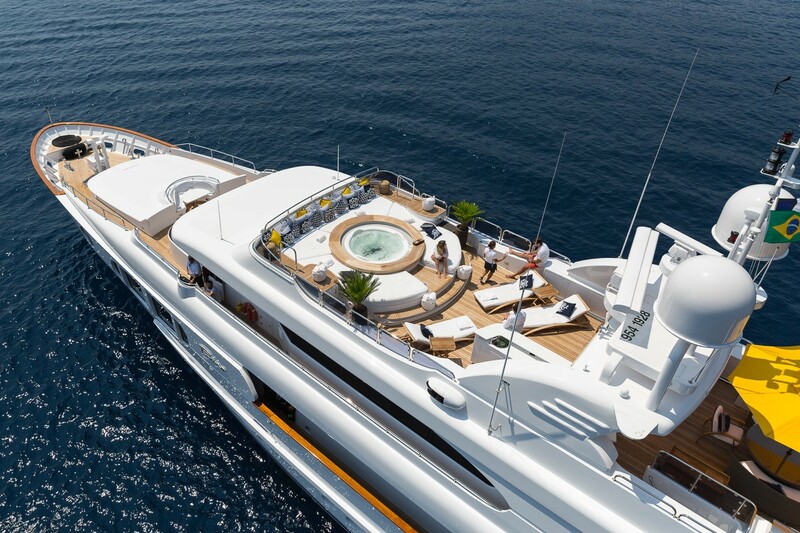 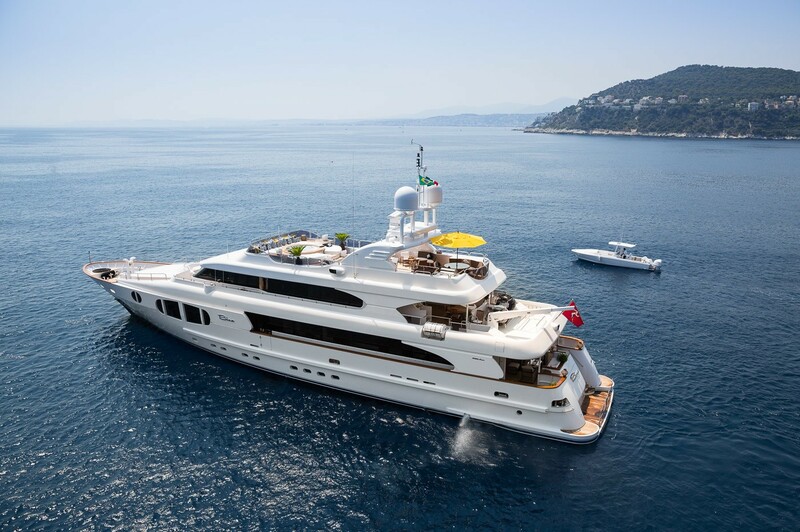 Luxury motor yacht BINA (ex Kimberly ii) is a 42-meter displacement luxury yacht created by Italy’s Mondomarine. 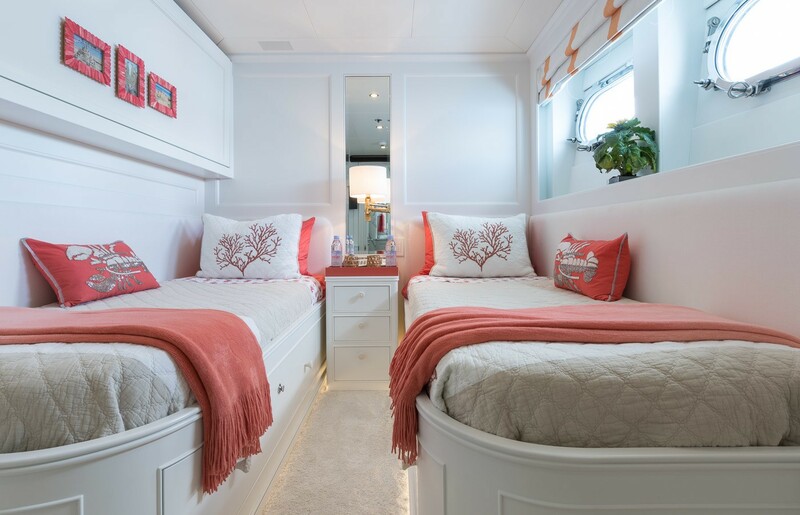 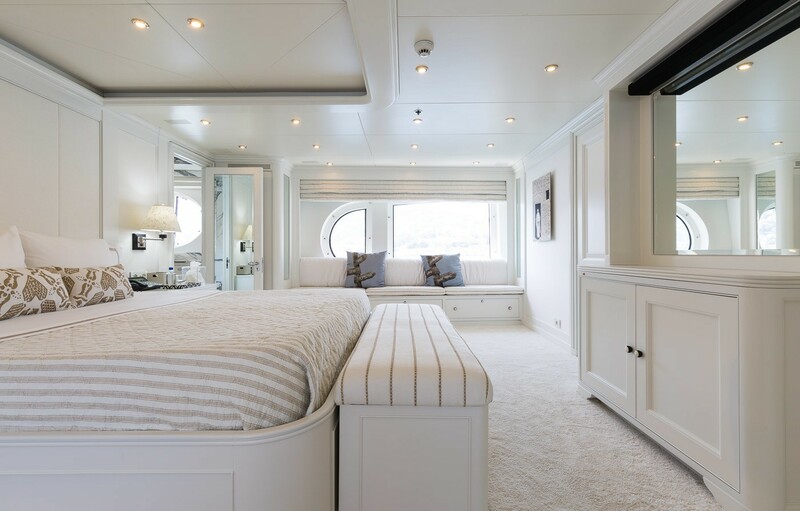 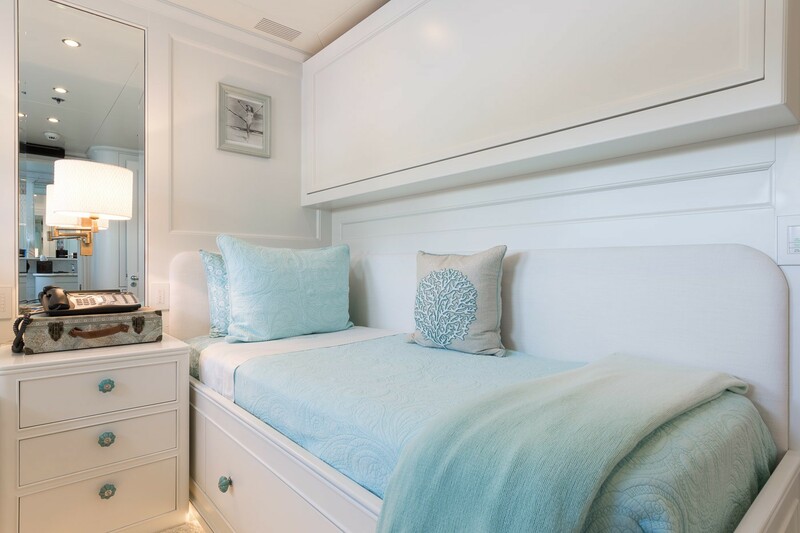 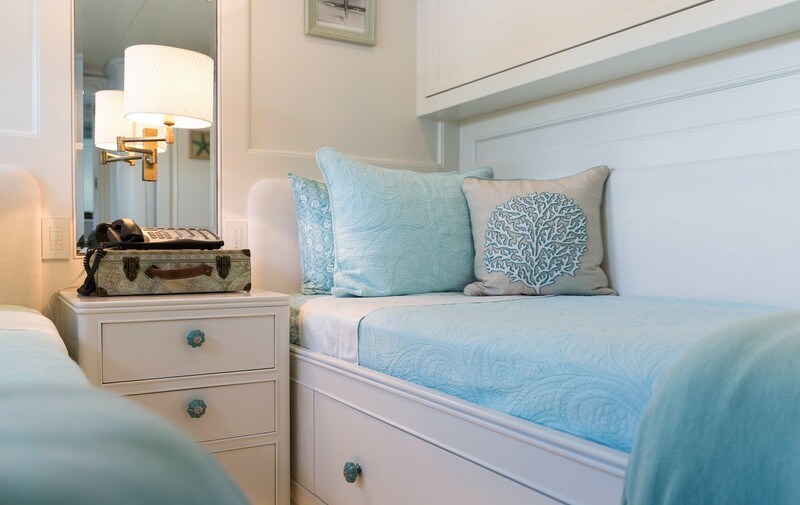 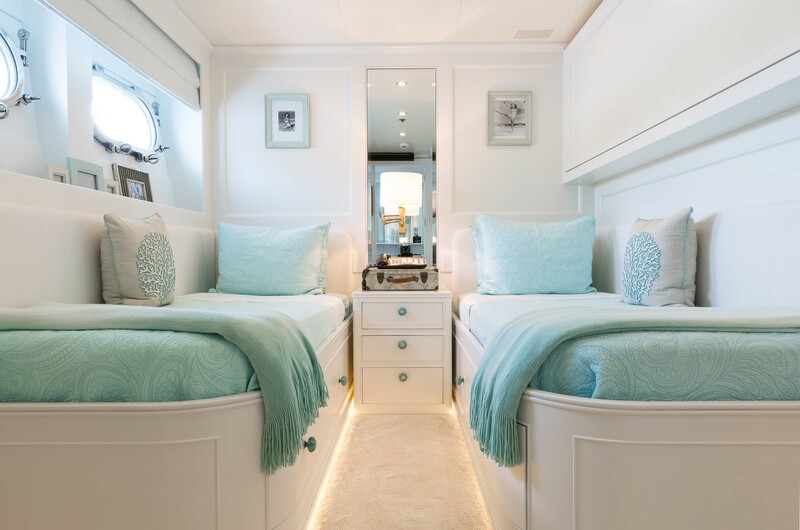 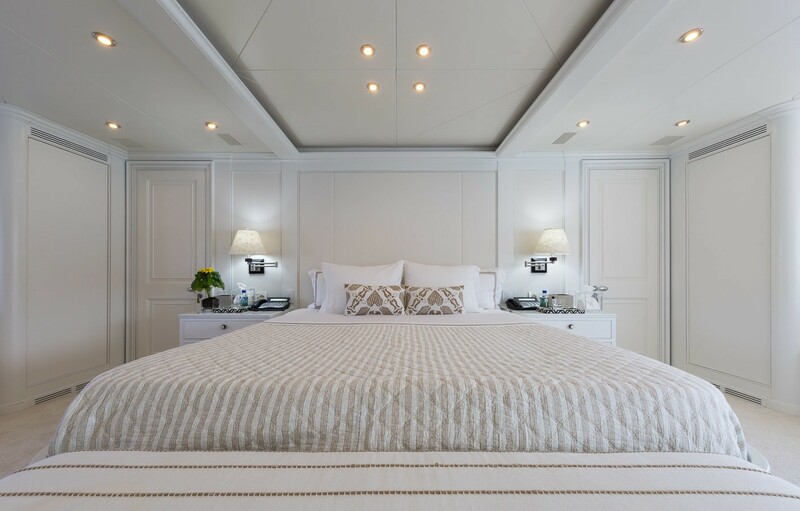 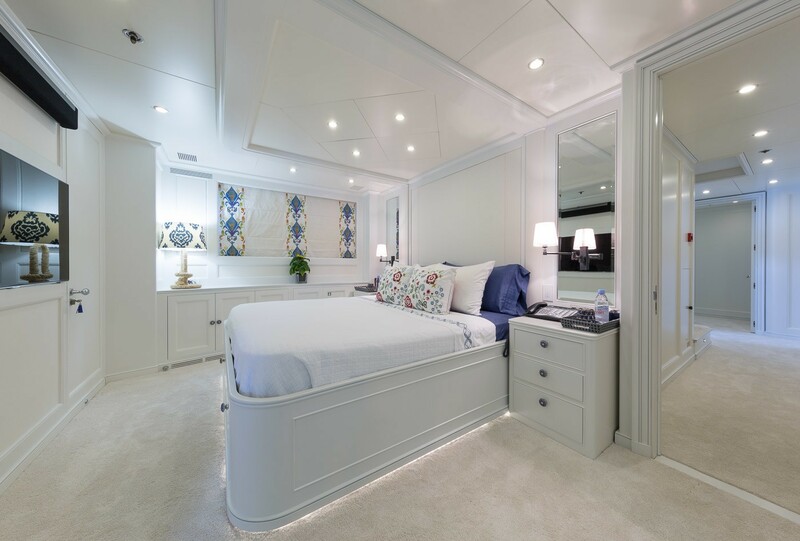 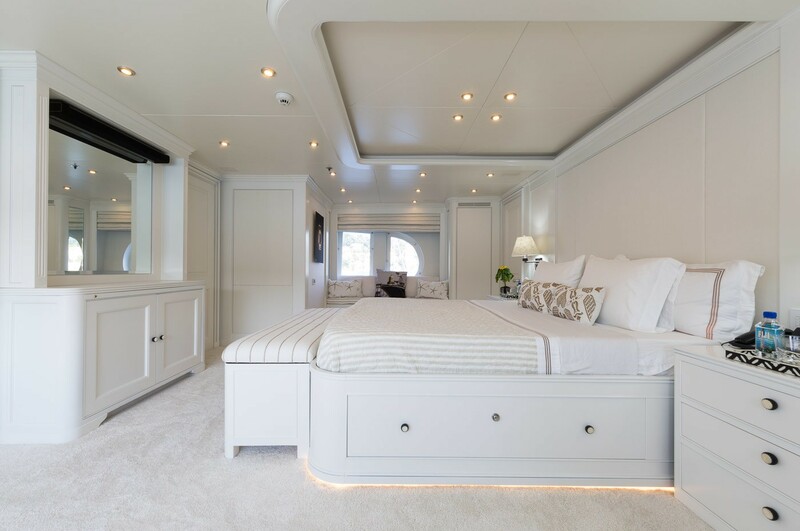 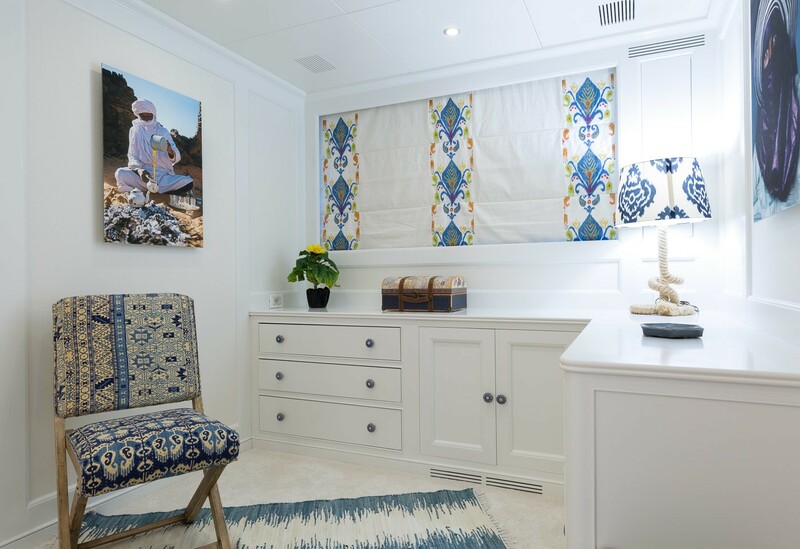 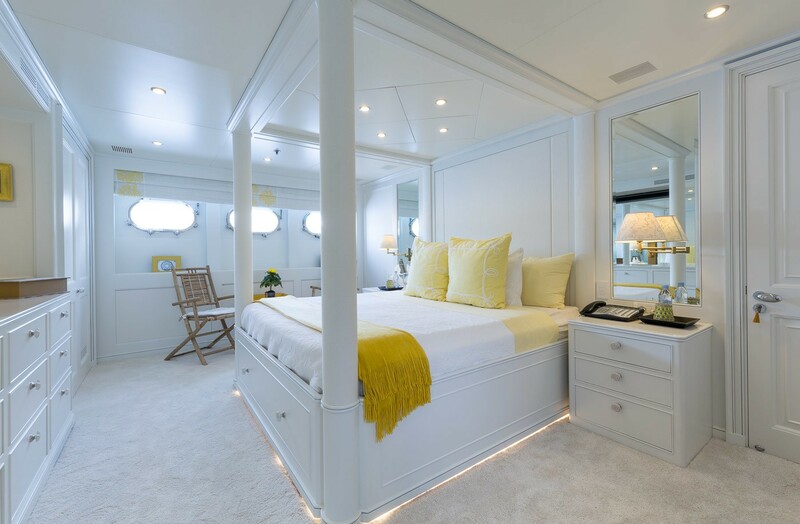 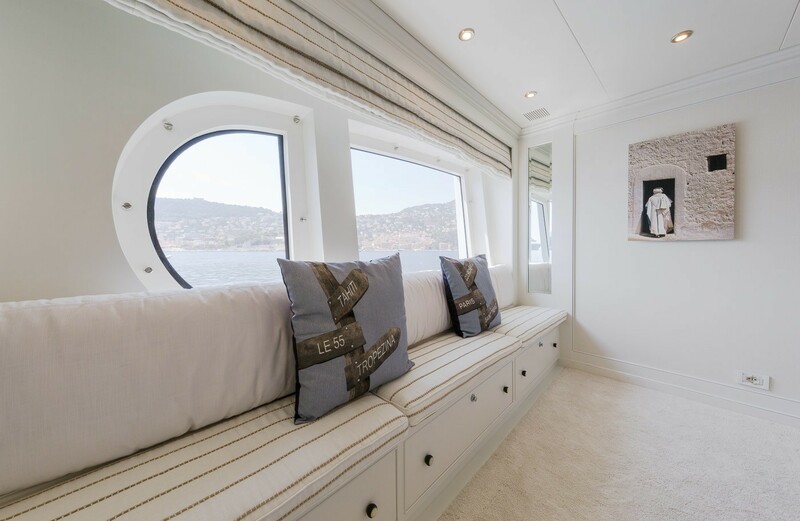 She provides accommodation for up to 12 guests in 5 cabins and features interiors by MNS Interior Design. 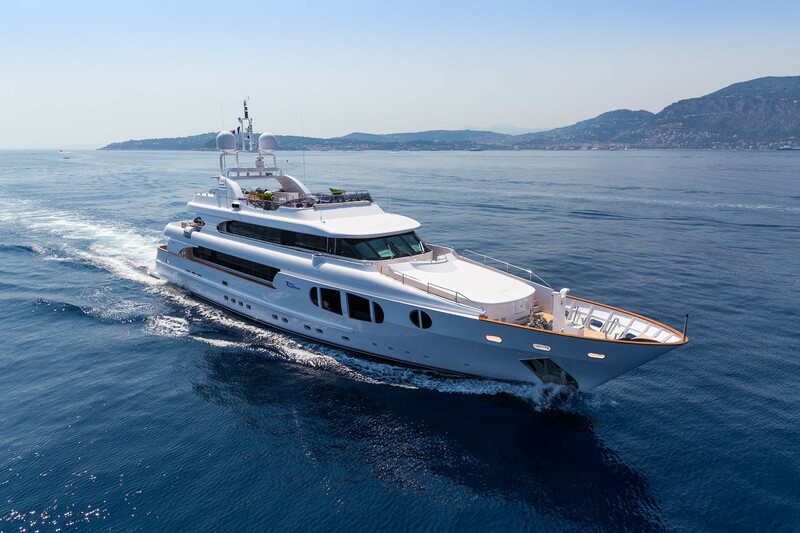 She was launched in 2006 and refitted in 2015. 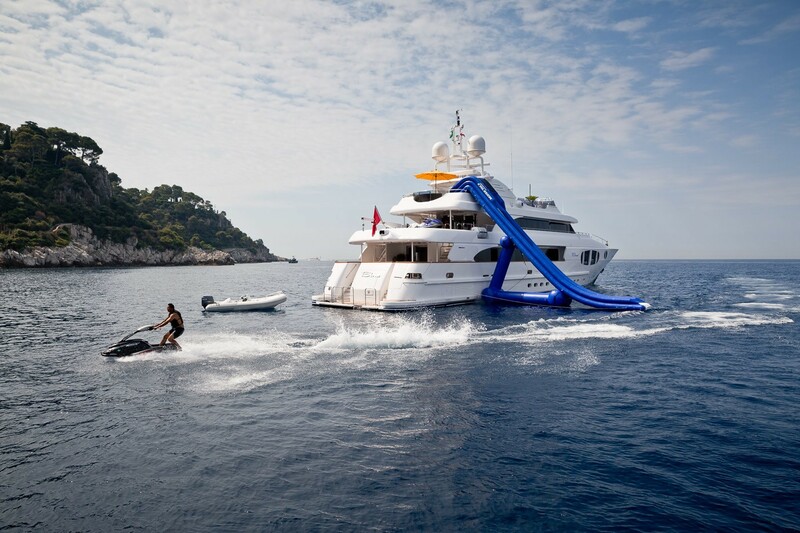 There is a crew of 9 aboard. 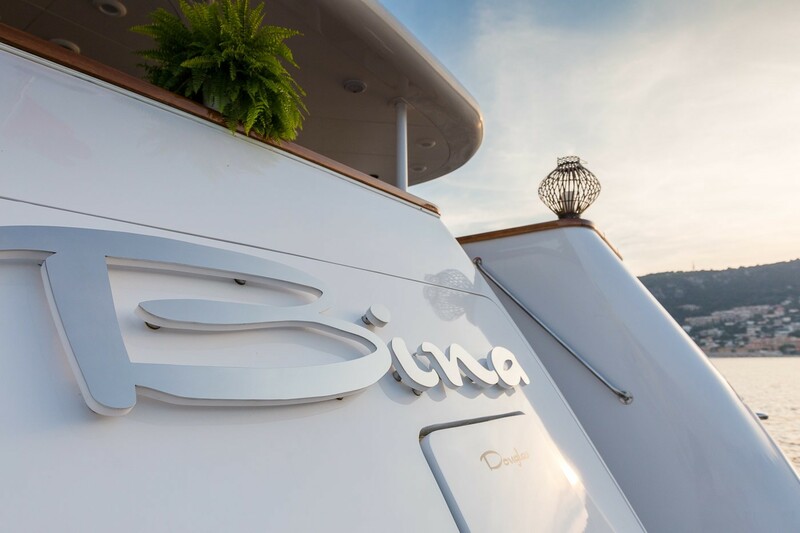 Superyacht BINA is a traditional displacement yacht with a spacious Gentleman club interior style. 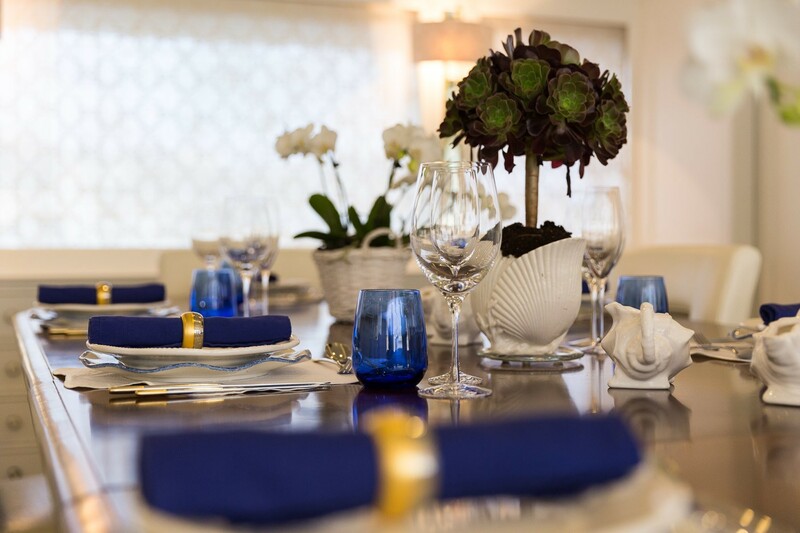 The main salon has been specifically designed to make her guests feel welcome and comfortable. 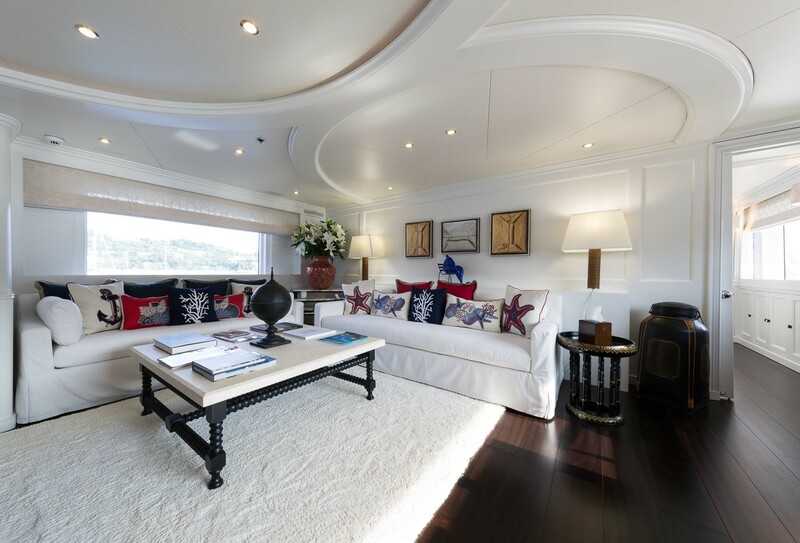 The classic English gentleman’s club-style deco is warm and cosy, featuring satin-finish mahogany and myrtle and ebony inlay. 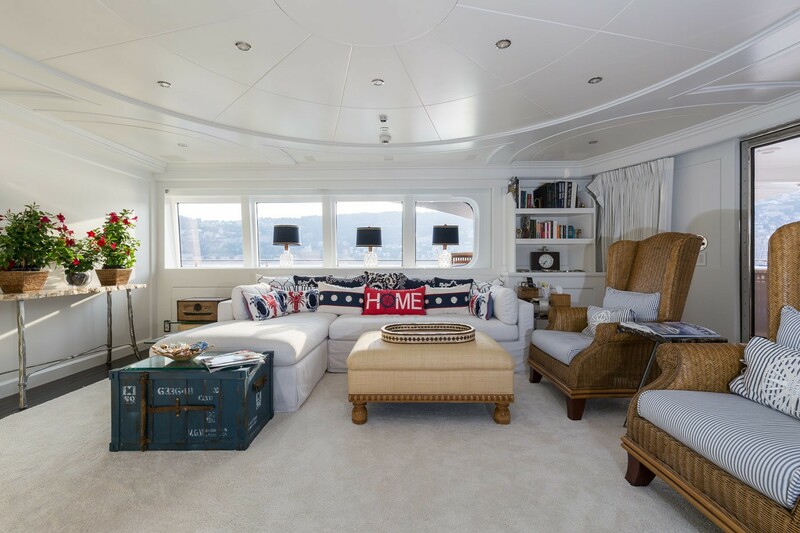 The huge windows provide plenty of natural light allowing a magnificent view on the outside, even when seated on the comfortable and oversized couches. 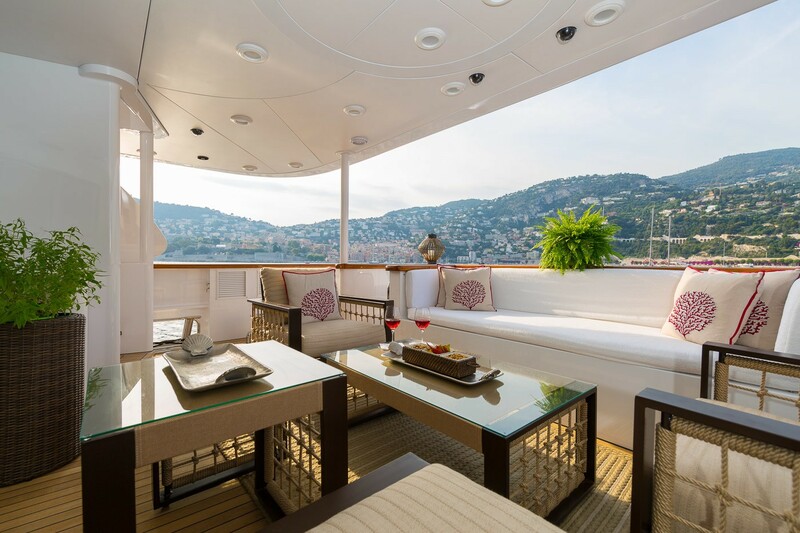 The large pop up flat screen TV is located on the starboard side and refreshments can be served at the bar whose top is covered with granite. 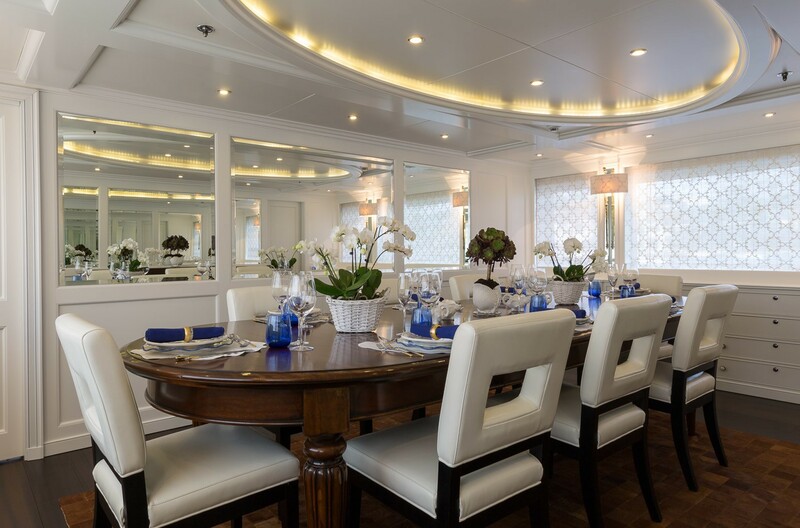 The separate formal dining room is located between the main salon and the galley and can be totally closed to be used as a meeting area if needed. 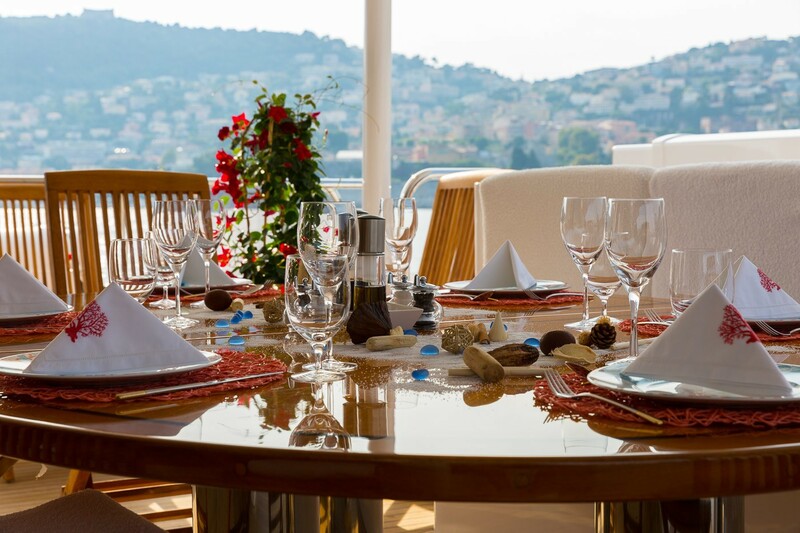 The large oval table can seat up to 12 guests in a warm atmosphere with great views of the sea beyond. 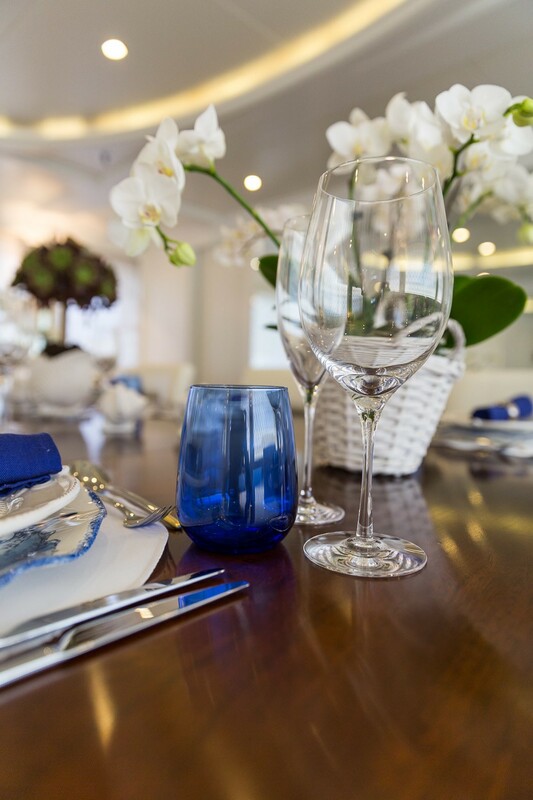 On each side of the dining room, above the windows, there is plenty of storage for cutlery, plates, glasses and general tableware. 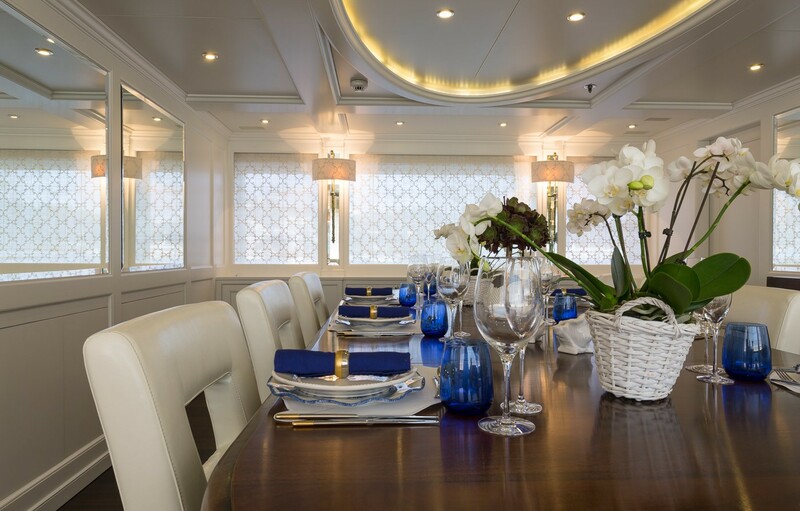 The galley is fully equipped and located in the dining room and the crew area, for fast and easy service. 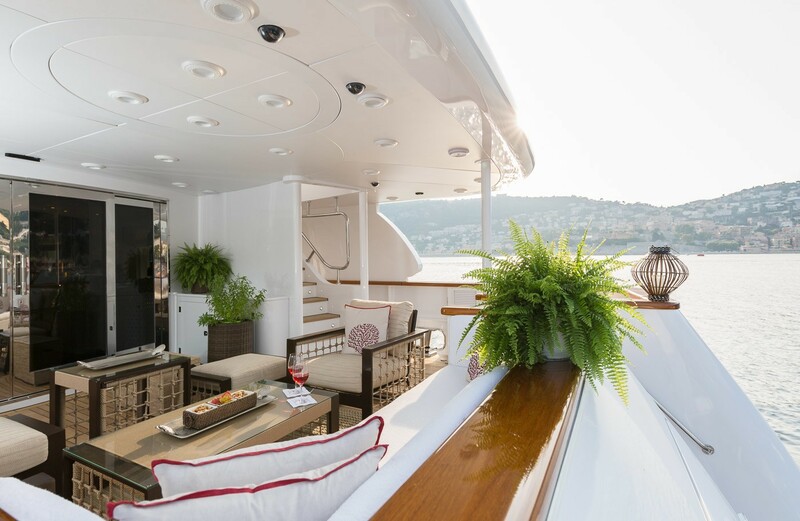 The Foyer, located on the starboard side, welcomes guests who step on board by the side gangway. 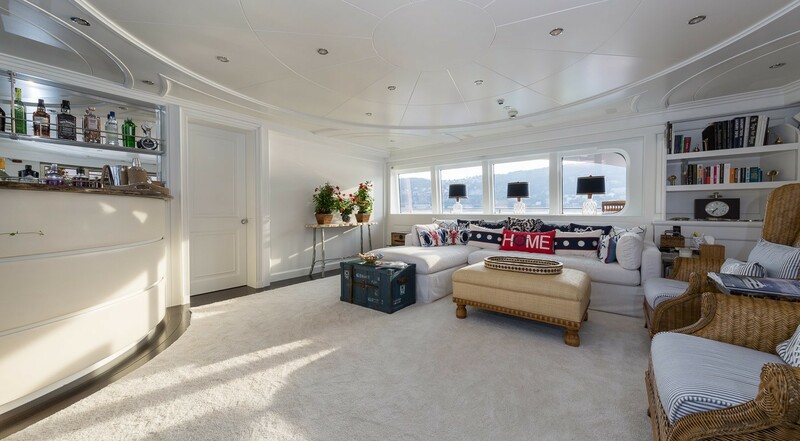 The foyer also gives access to the staircase leading up to the Upper Deck and down to the Lower Deck, to the day head and the well-equipped gym fitted with a running machine. The upper deck boasts a large sofa and two low tables facing the bar and a flat-screen TV that is connected to Sky TV and a DVD player. 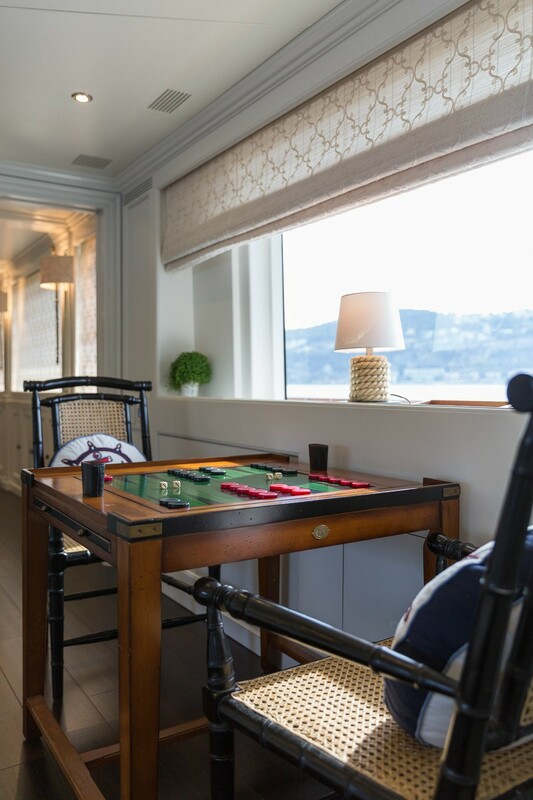 There is also a coffee/game table with three chairs and sofa. 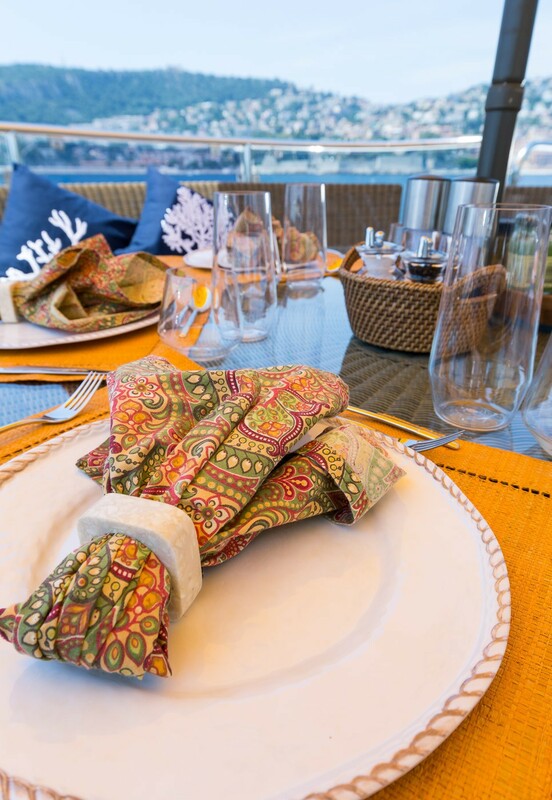 From this deck, the view of the sea is magnificent. 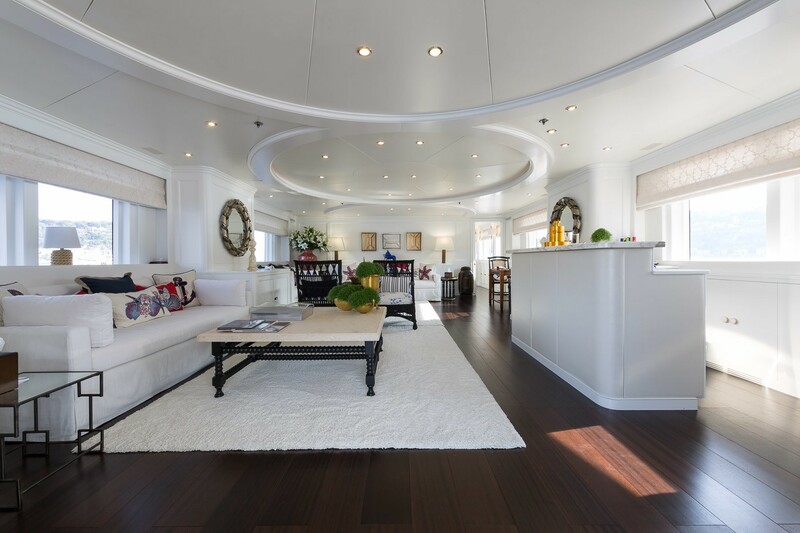 The wheelhouse is well equipped for high sea navigation and offers a very good visibility around the boat. 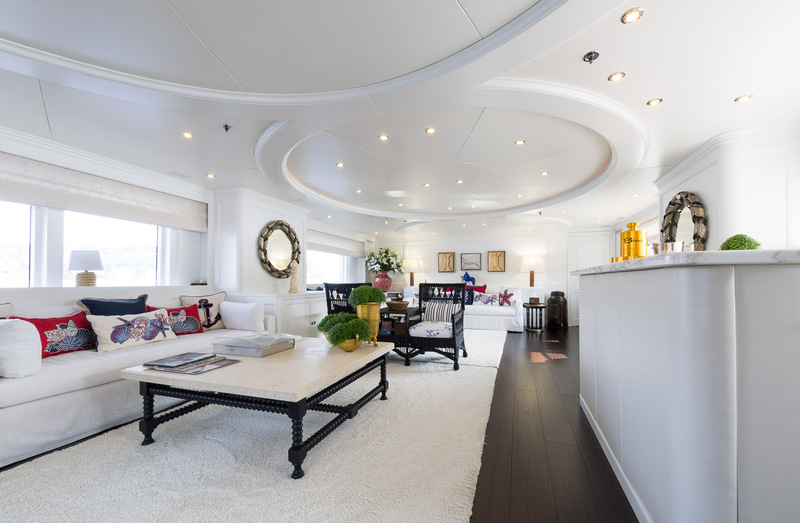 There is access to the side decks on each side of the wheelhouse for easy and fast circulation when manoeuvring. 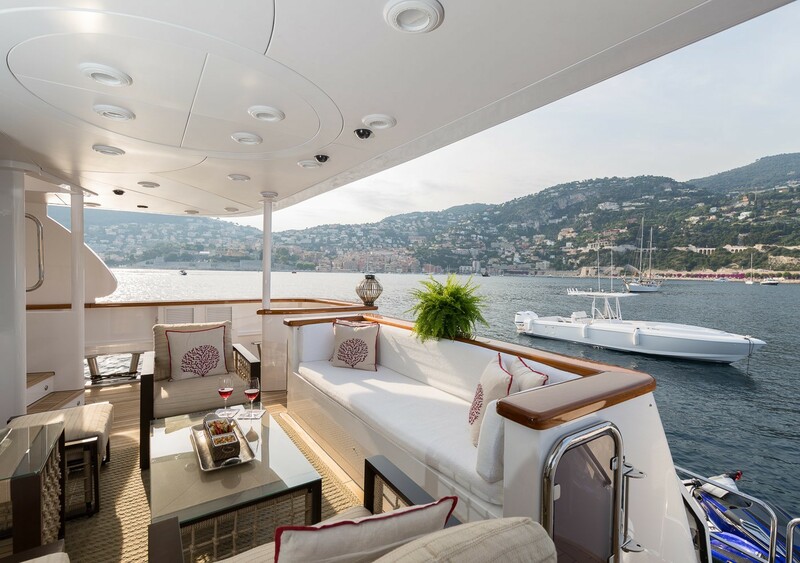 Full bridge wing controls on both side of bridge offering excellent vision down the length of the yacht. 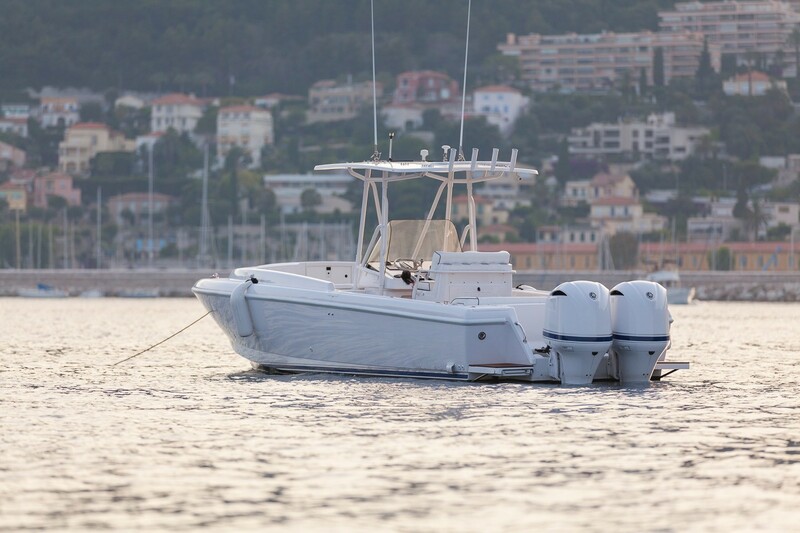 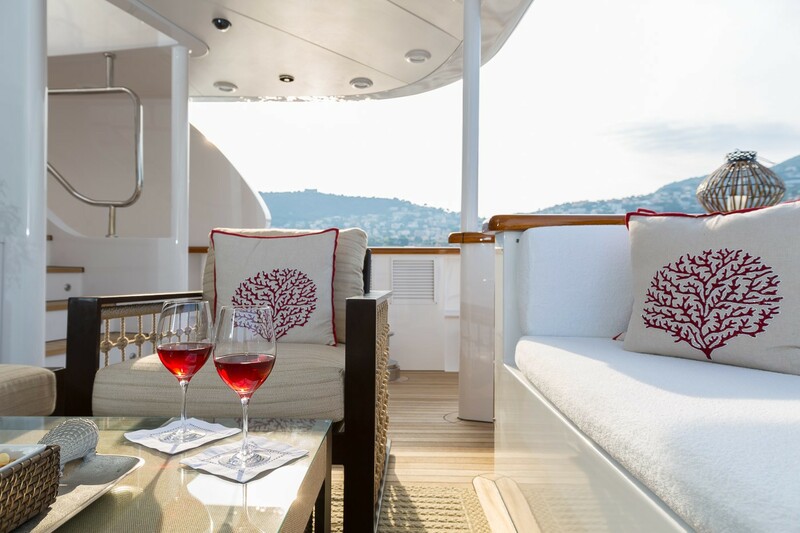 Luxury motor yacht BINA provides yacht charter accommodation for up to 12 guests five cabins. 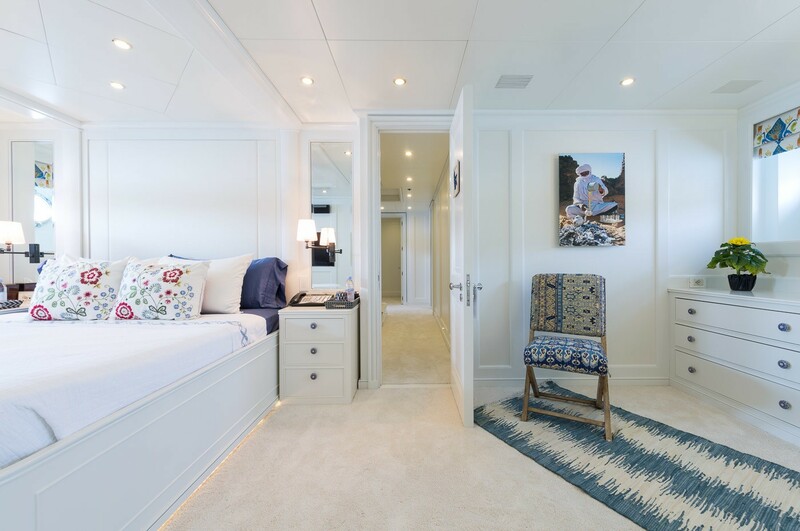 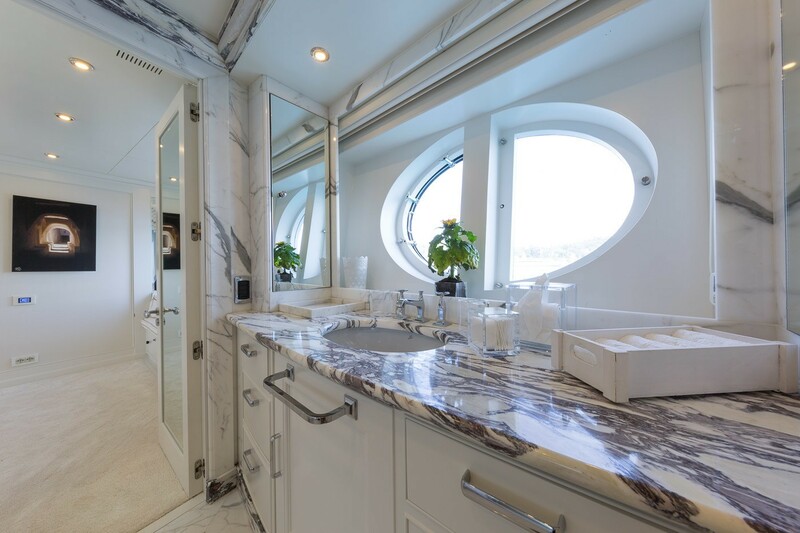 The full beam Master Stateroom is located forward on the Main Deck and is fitted with huge windows offering brilliant views and two opening portholes for fresh air. 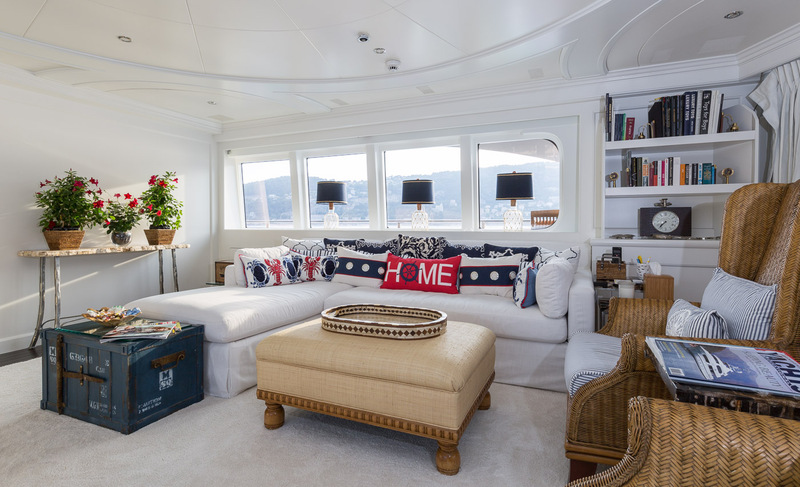 There is a sofa on starboard which provides a perch just above the water and an office desk on portside where guests can work on a laptop thanks to the Wi-Fi connection throughout the boat. 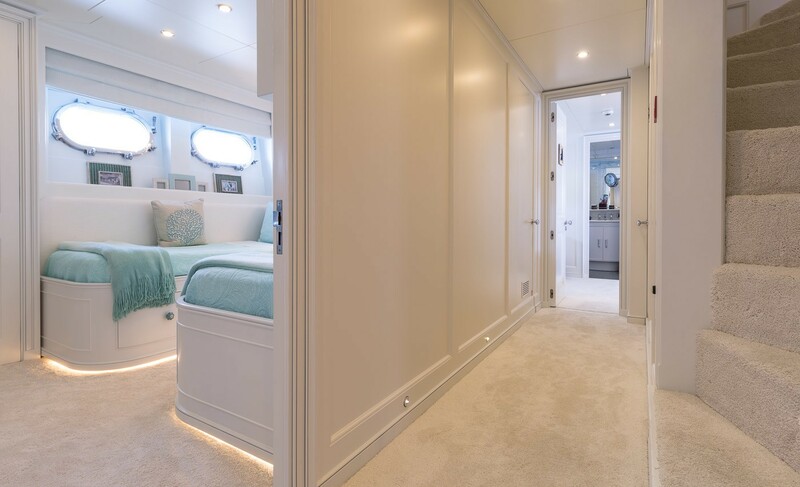 The large pop up flat screen TV, Sky TV and DVD player is located in front of the king size bed, and there is a large walk-in dressing room behind the TV as well as two wardrobes on each side. 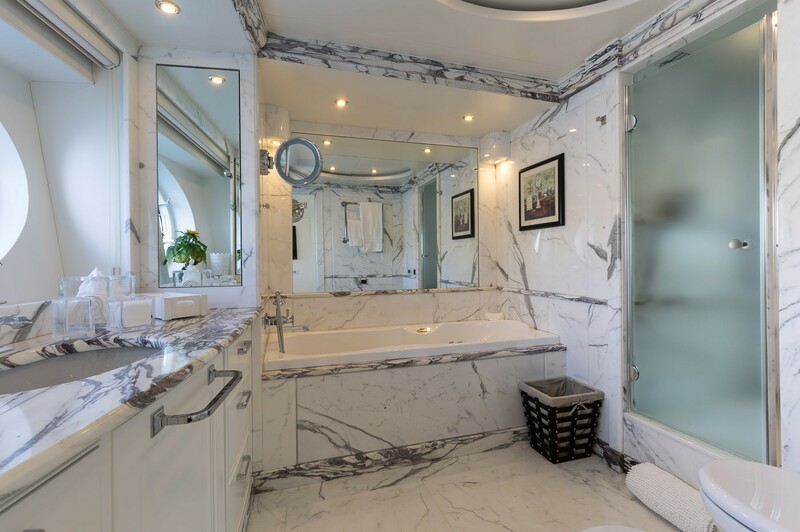 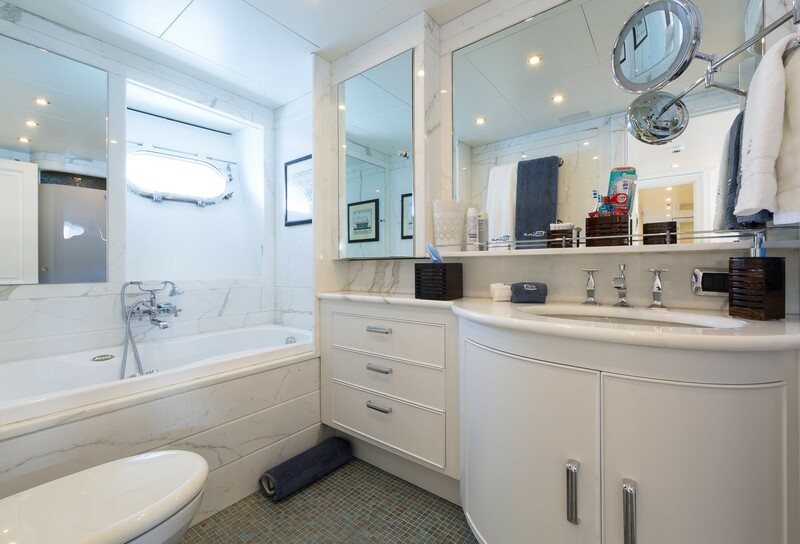 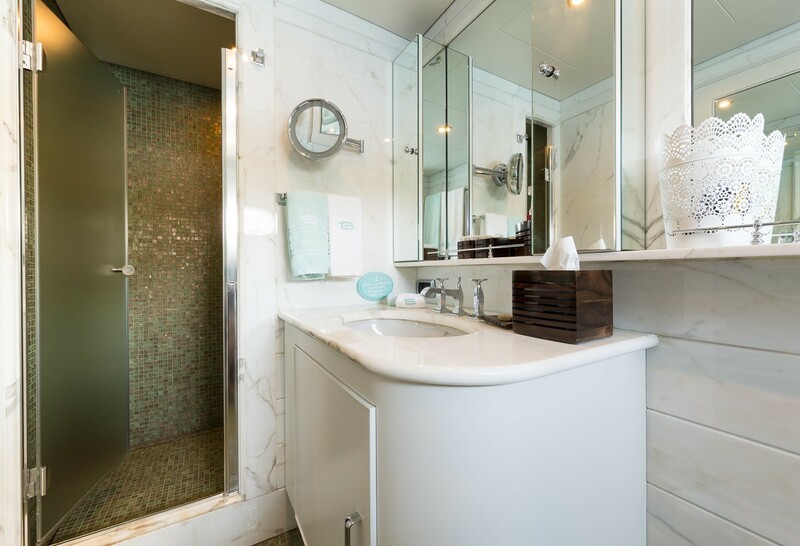 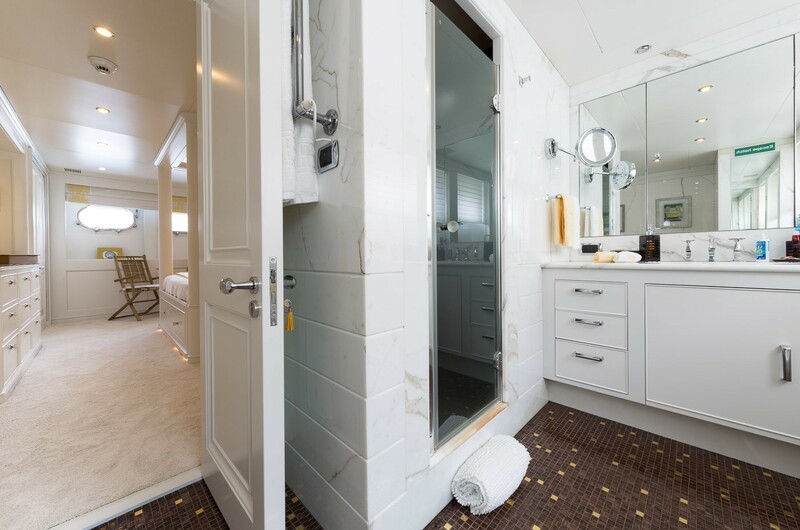 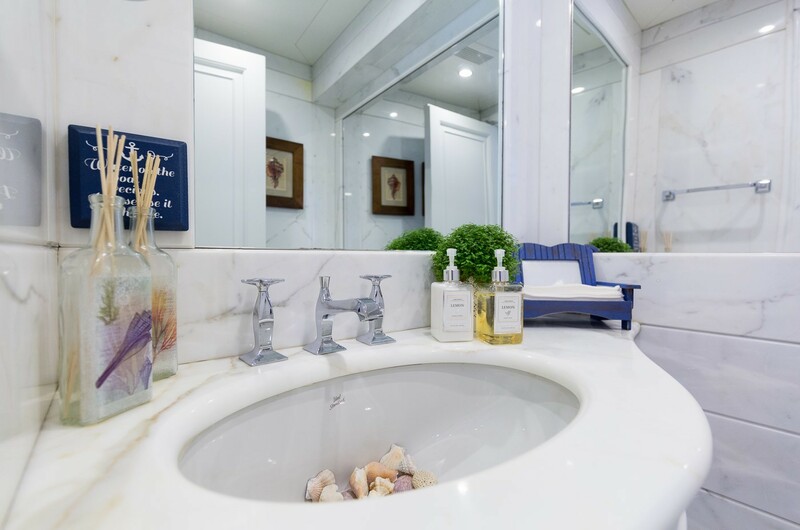 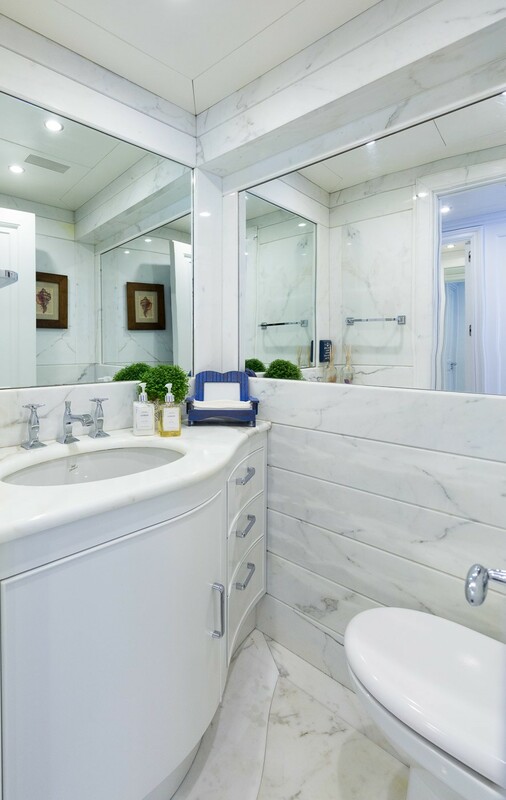 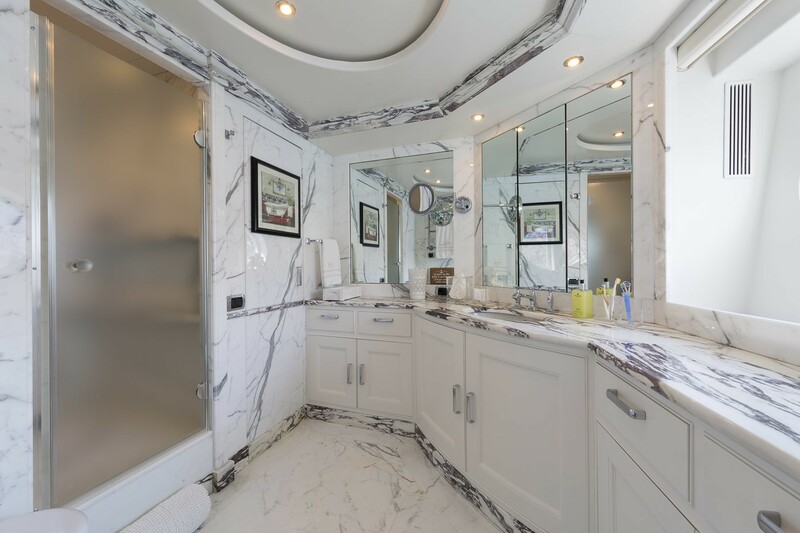 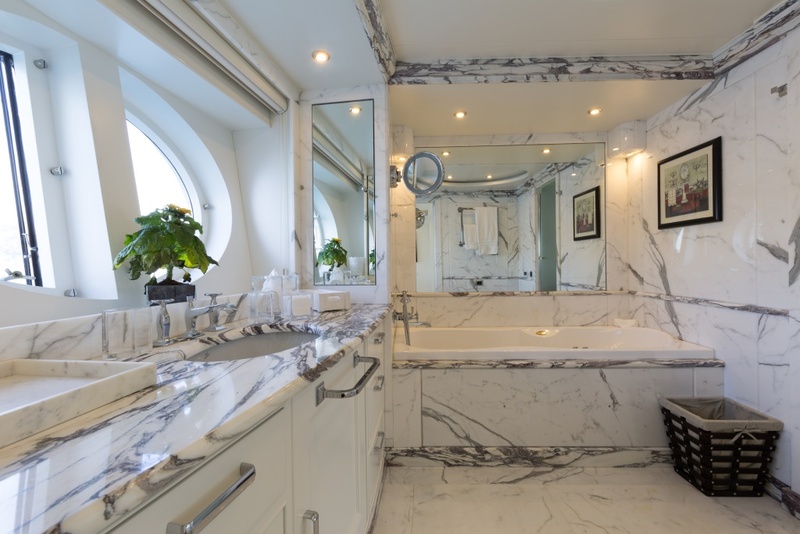 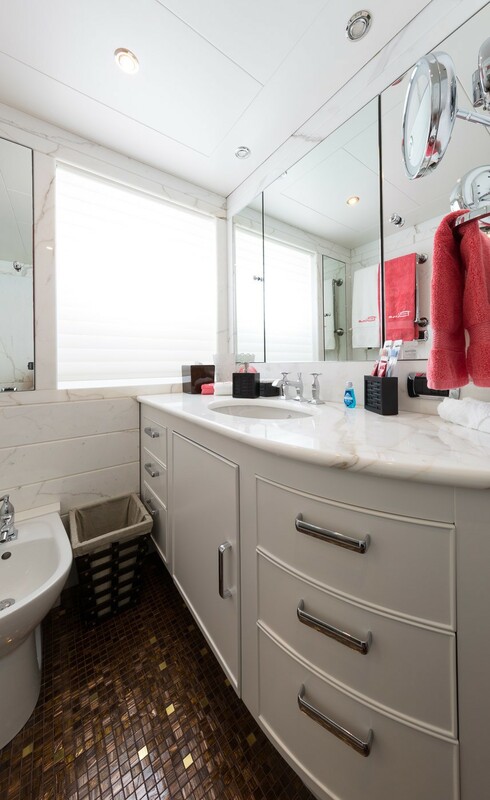 His and Hers bathrooms with separate access are located forward, with a Spa Pool bath in the portside bathroom and a huge shower with access from each side. 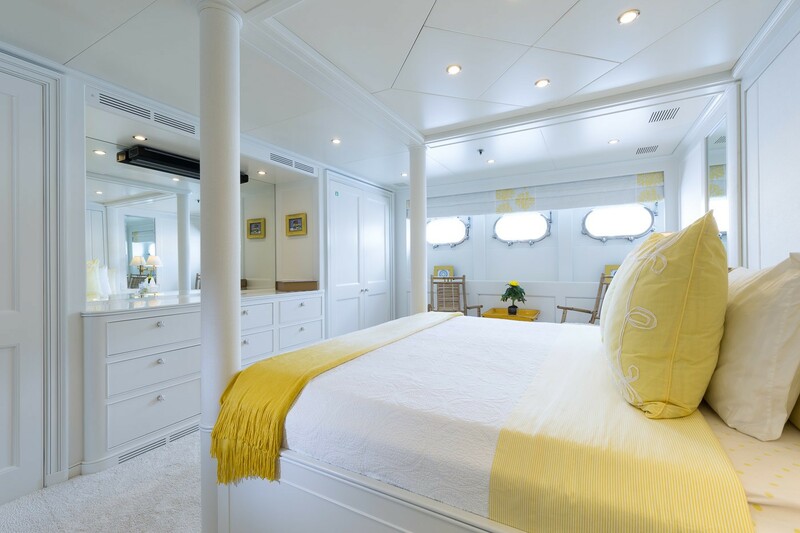 The remaining cabins are located on the lower deck and include two full beam VIP Cabins and two twin cabins. 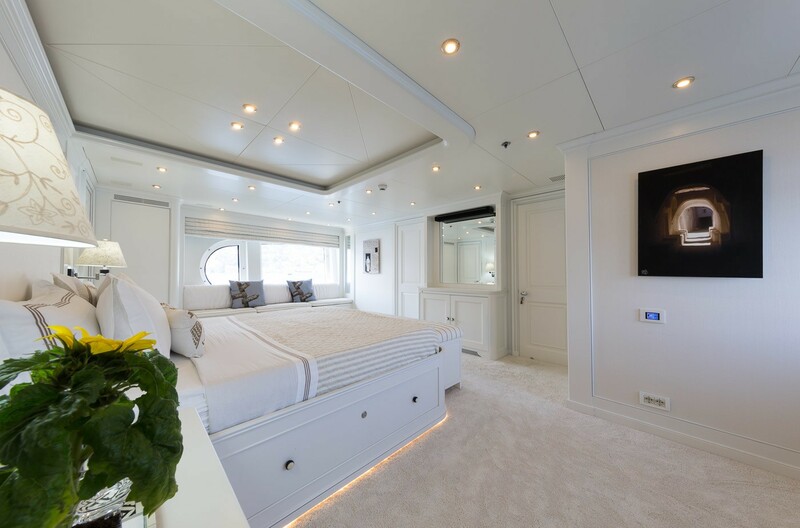 The Aft VIP cabin has a large bed facing a flat screen TV linked to Sky TV and DVD player, and two deep wardrobes with safe. 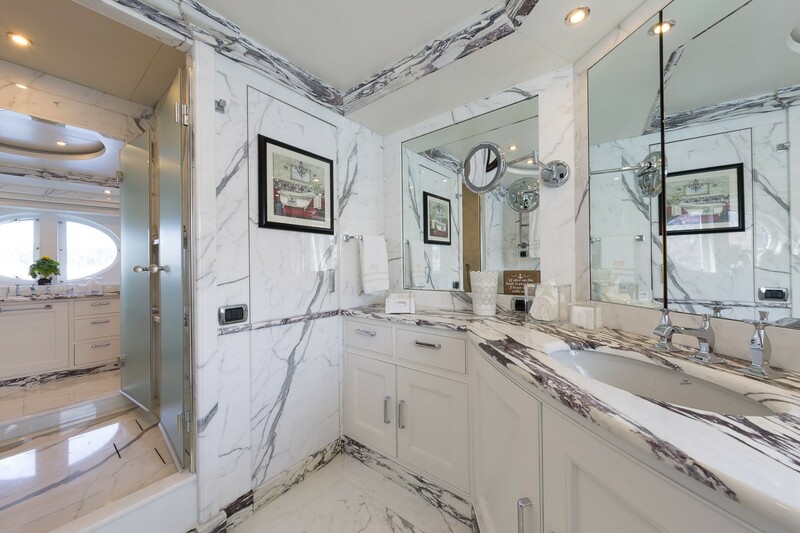 There is also a vanity desk on portside. 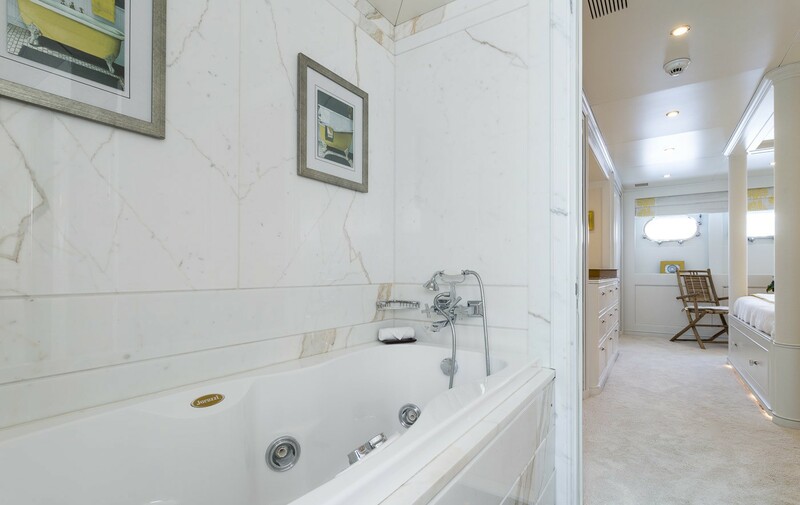 The large bathroom with sea view is well equipped with a bath/Spa Pool, shower, basin, toilets and bidet. 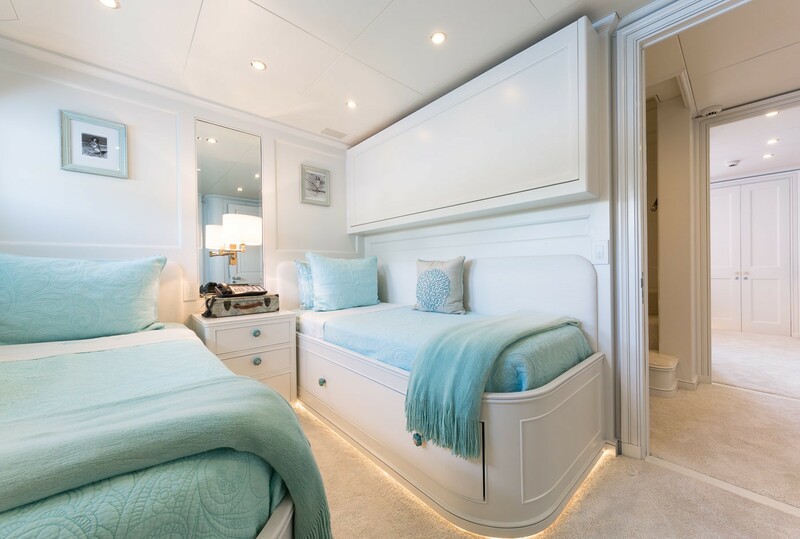 The forward VIP cabin delivers the same level of comfort as the Aft one, except that it has a walk-in dressing instead of the two wardrobes. 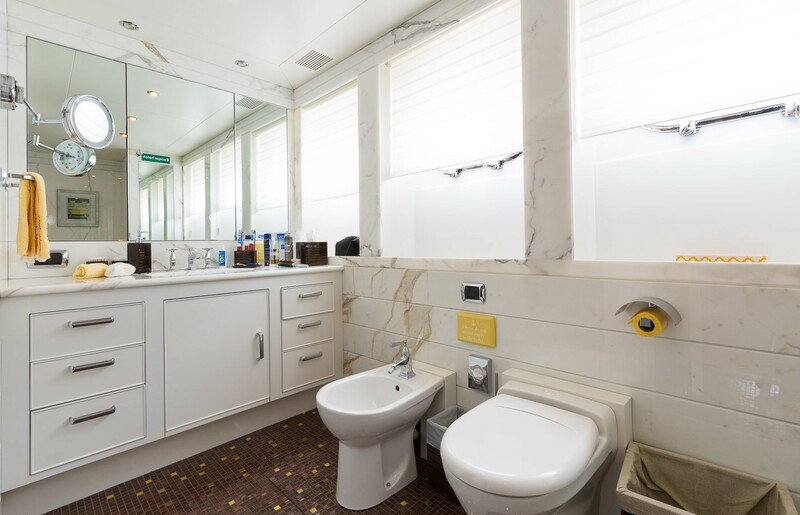 The two identical Guests Cabins are fitted with twin single beds and Pullman, wardrobe with safe, vanity desk, en-suite bathroom with shower, basin, toilets and bidet. 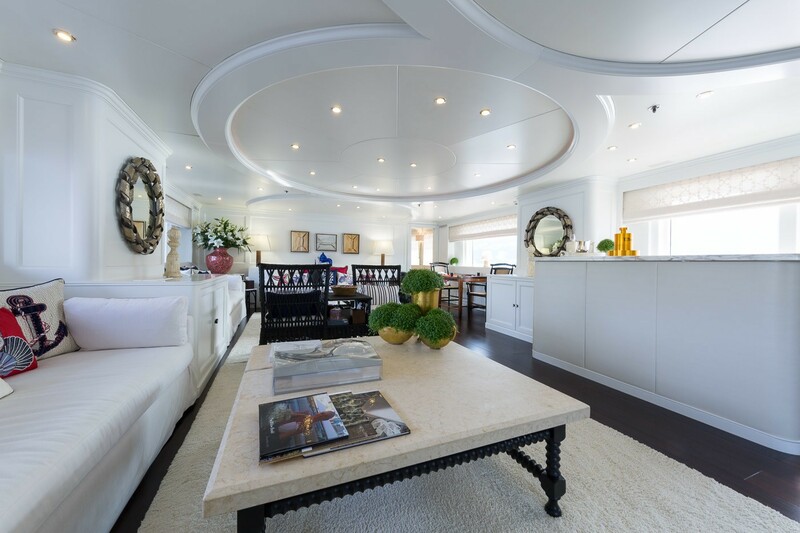 There is also a flat-screen TV with Sky TV and a DVD player. 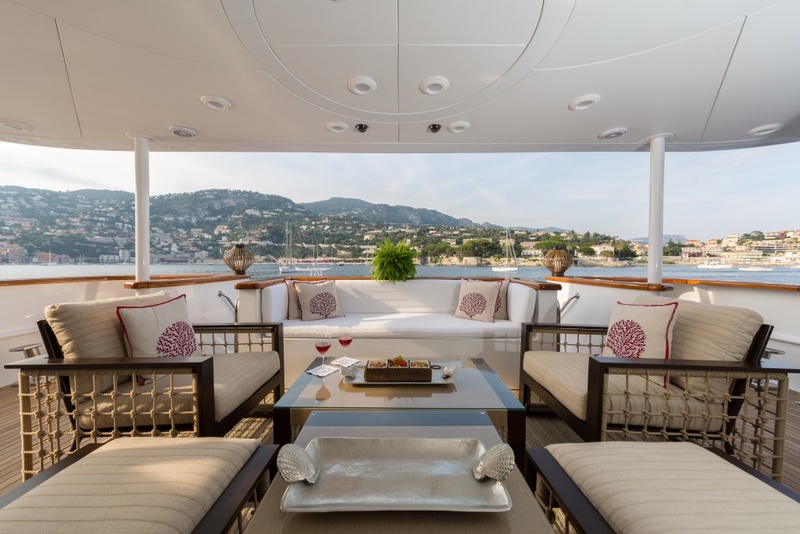 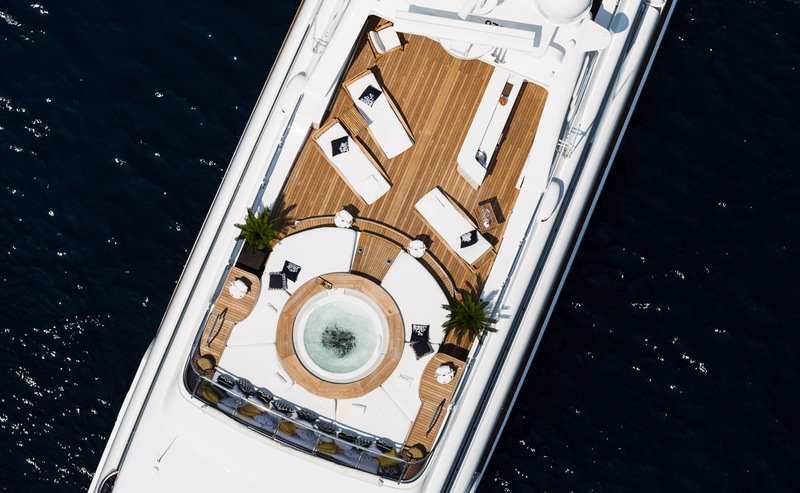 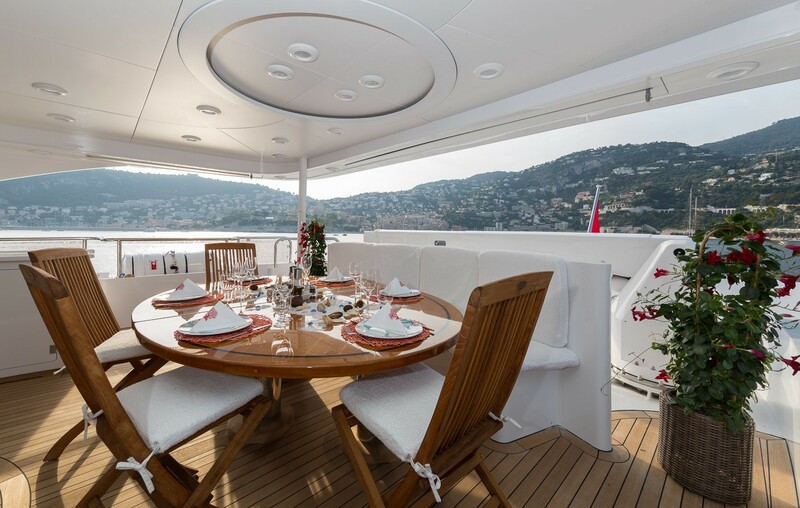 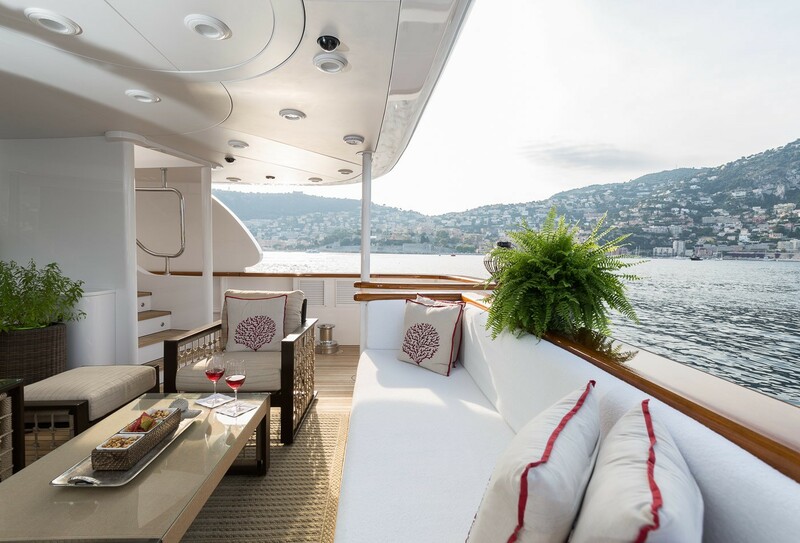 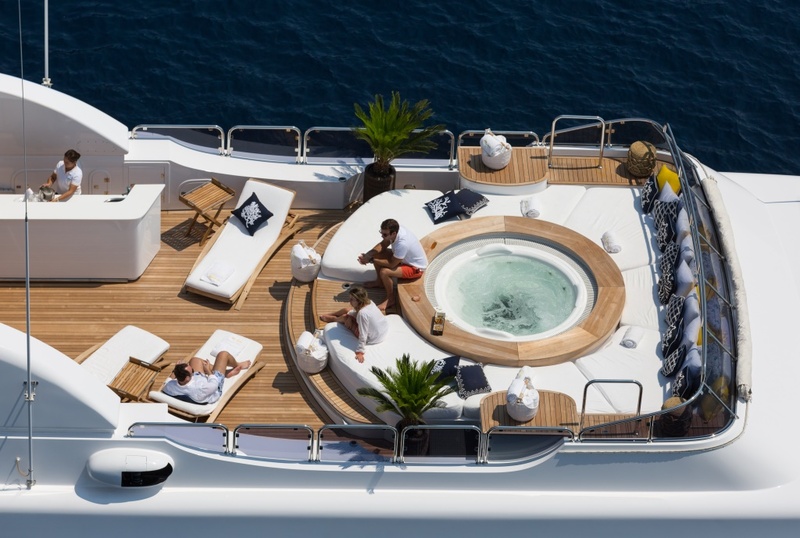 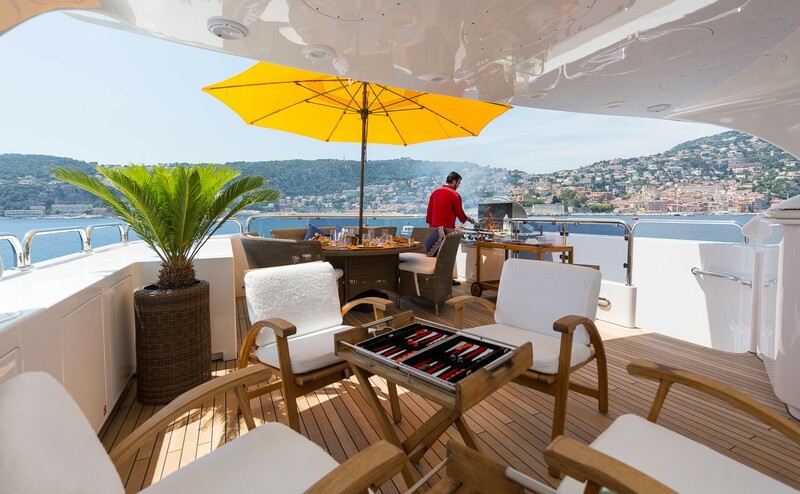 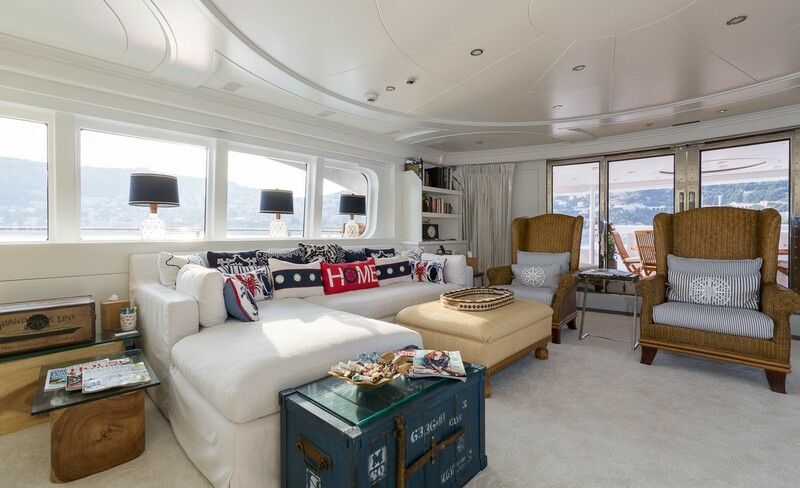 The outside deck spaces onboard yacht BINA are also spacious and well thought out. 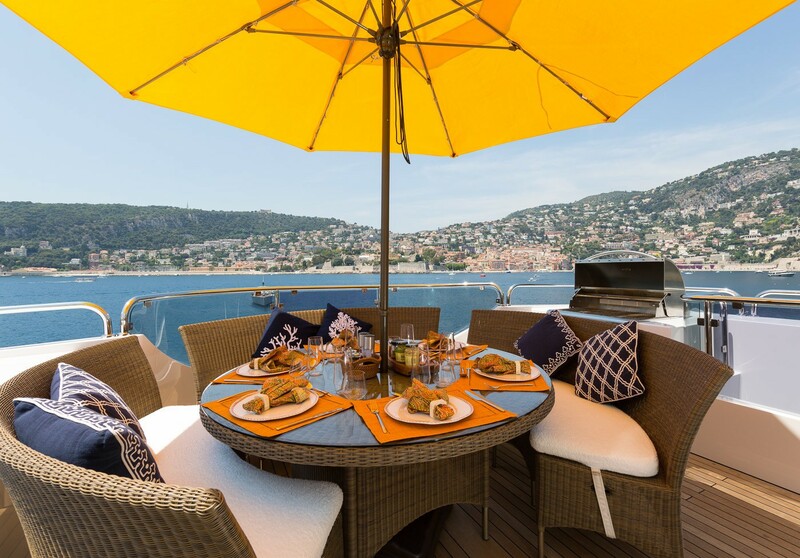 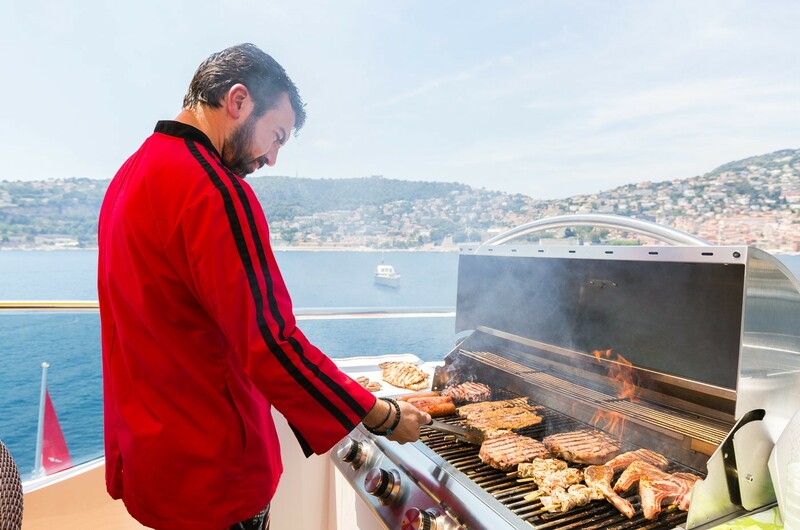 The Aft deck features a sofa and four chairs welcoming eight guests for al fresco dining or cocktails. 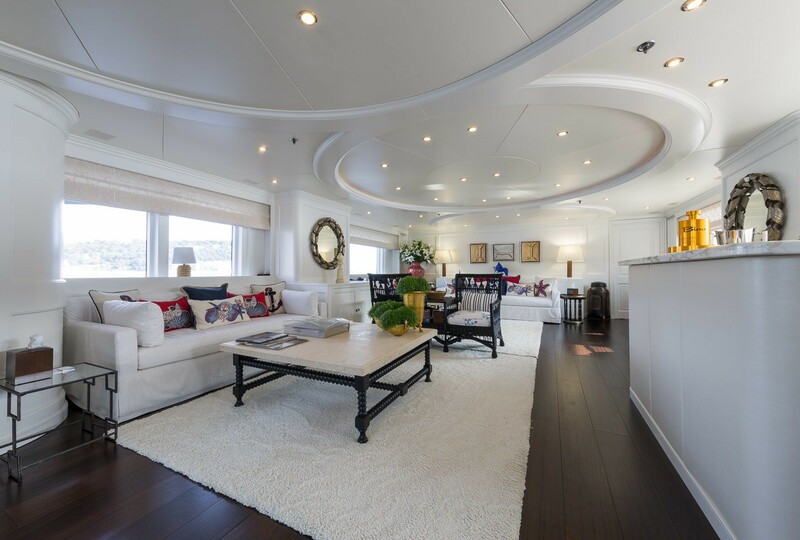 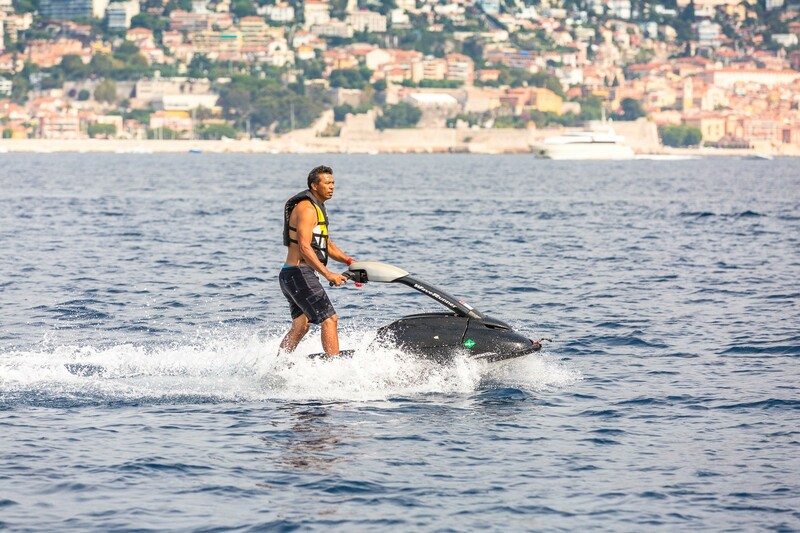 The Upper Aft Deck houses one of the two tenders and one Jet Ski. 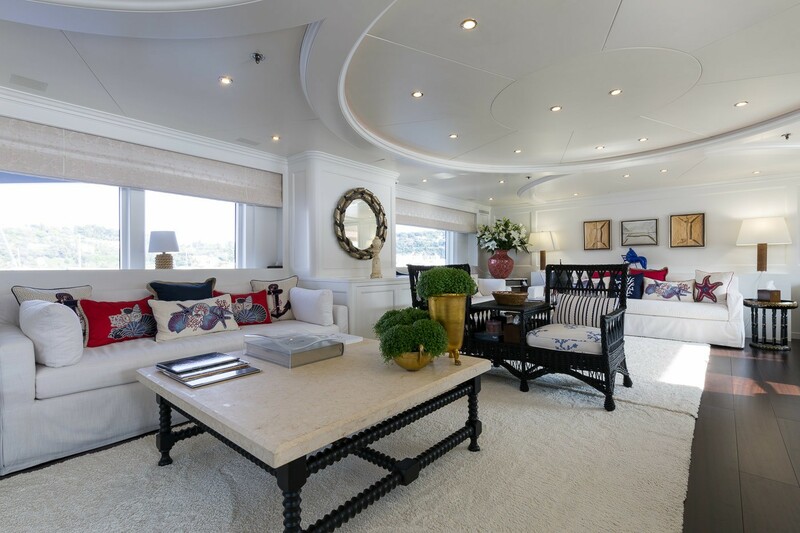 There is still enough room for an oval table that can host up to 8 guests on chairs and sofa. 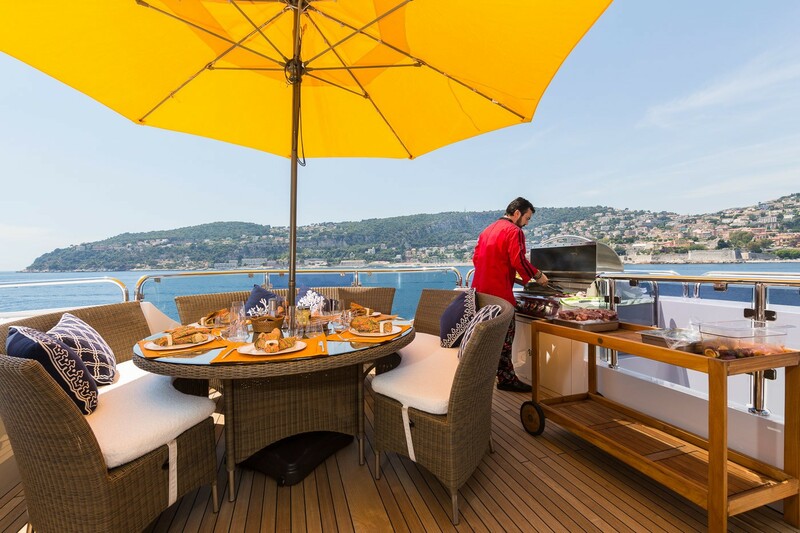 The Sun Deck is fully equipped to enjoy the long summer days, and there is a sun awning if the shade is needed. 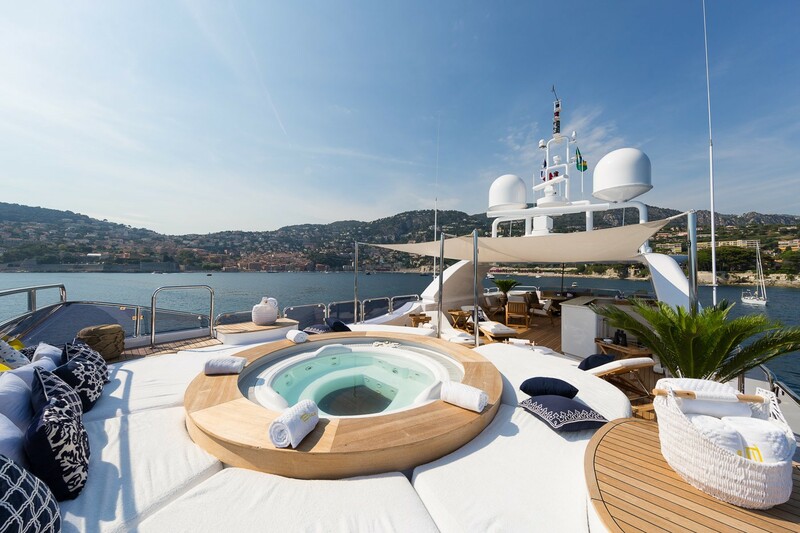 The Spa Pool is surrounded by a large sun tanning area which is the perfect place to enjoy refreshments served from the circular bar under the radar arch. 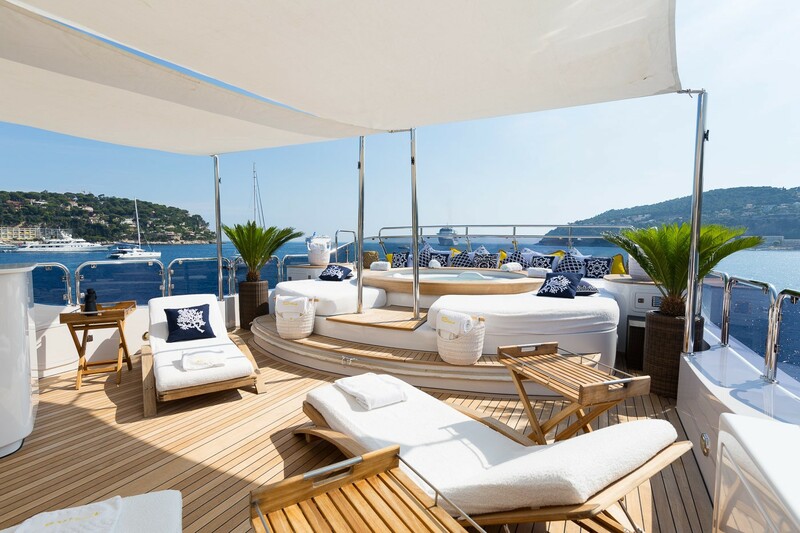 On the aft of the Sun Deck, there is plenty of space for beach chairs in addition to the sofas. 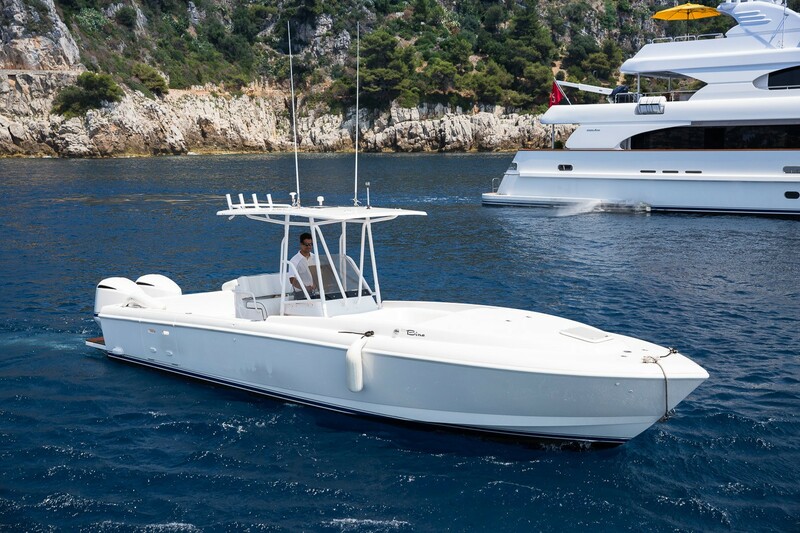 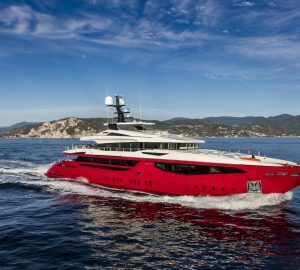 With her Rolls-Royce variable pitch propulsion system, the speed and fuel consumptions can be micro-adjusted and make this yacht very economical to run. 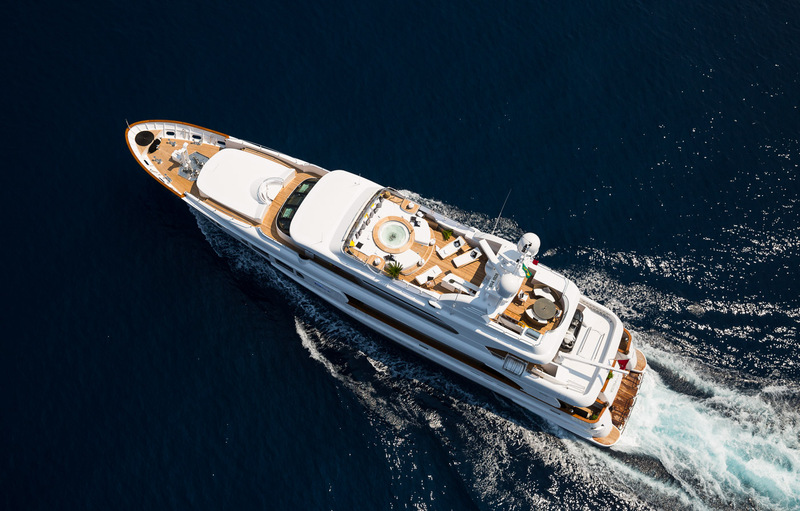 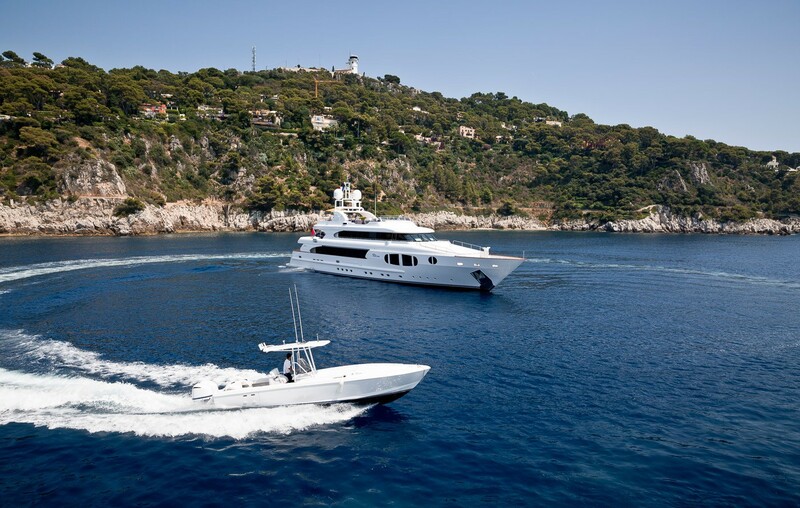 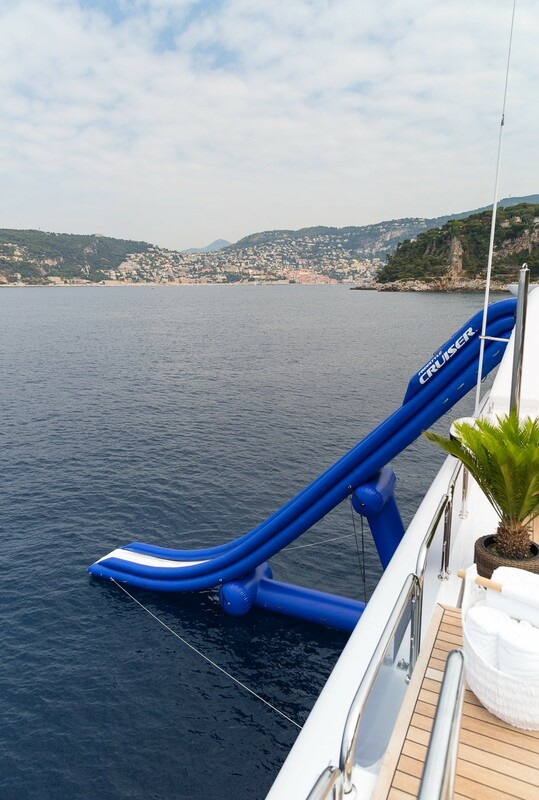 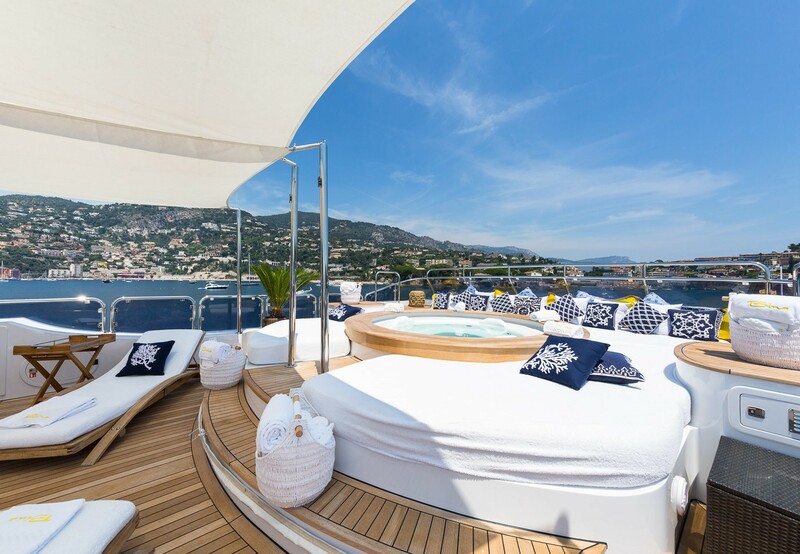 Luxury motor yacht BINA provides the following yacht charter accommodation: 1 Owner's suite, with 2 bathrooms with Spa Pool and shower, 2 VIP Cabins, with Spa Pool bathrooms, 2 twin cabins, plus Pullman bunks. 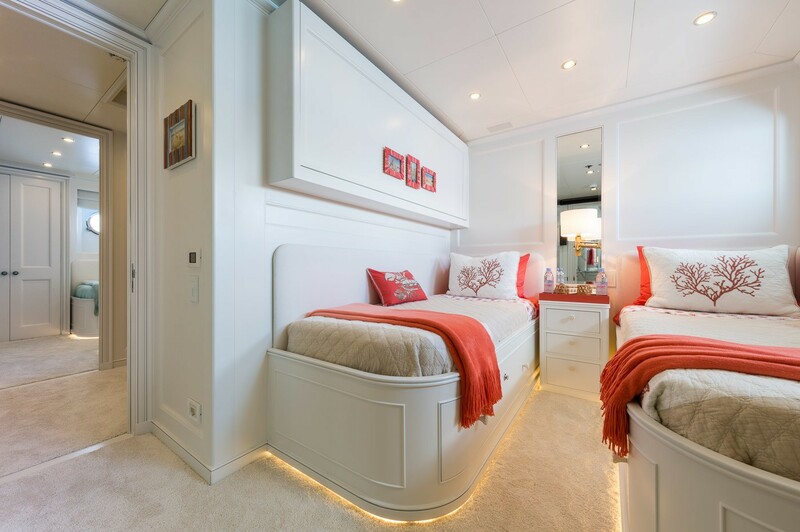 1 extra cabin on upper deck, suitable for children or accompanying staff. 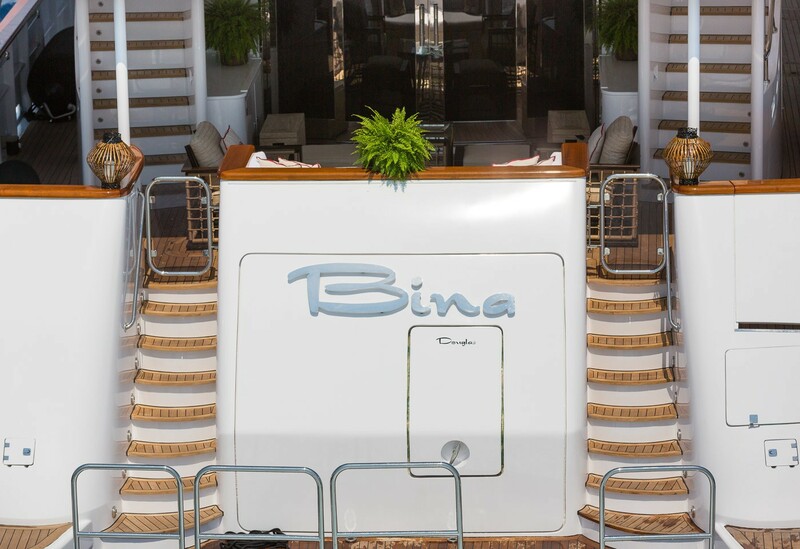 Luxury motor yacht BINA offers the following yacht charter amenities and toys: Tenders & Toys: 2 Waverunners, 1 Stand up Jet Ski, 35ft Tender 2 x 250hp Yamaha, 5m Tender, 2 Stand up Paddle boards, 1 Windsurfer, Wakeboard, Water Ski's, Various towables, Snorkling gear, 2 Underwater scooters, 1 Huge Slide, Fishing tackle. 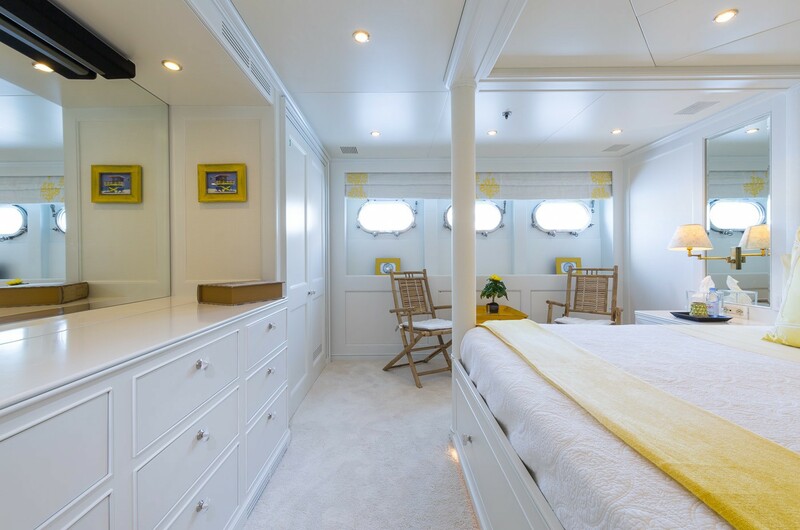 Audio Visual Equipment and Deck Facilities include Flat Screen TV, DVD player and CD and radio, internet and phone in all cabins. 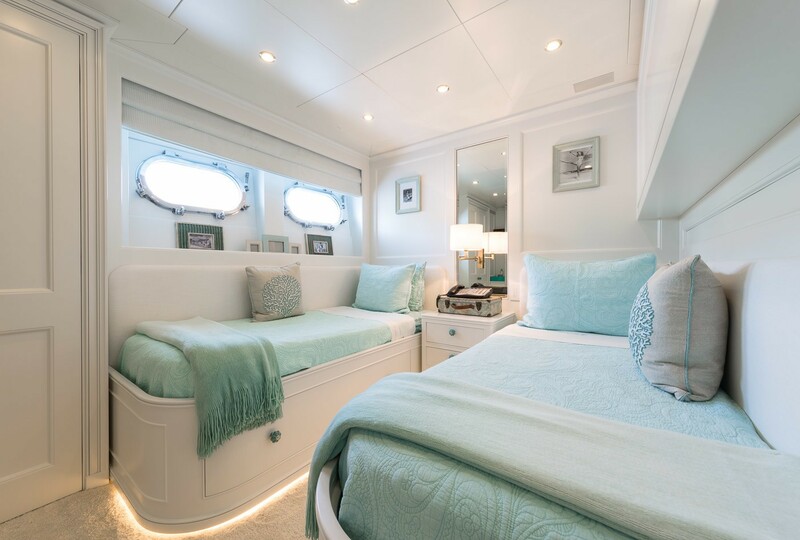 Communications Internet and phones in all cabins.